When we went on holiday, we were really nervous about how T would sleep whilst staying in a caravan. Although he can nap during the day, at nighttime it has to be calm and dark before he drifts off until 7am. In the summer months, T used to wake up every morning at 4am as soon as the light came through the windows. Thankfully we could usually get him back off until 6am/7am after a feed, but he woke up nonetheless. Caravans are notorious for thin curtains – so light would definitely be an issue. Plus, being somewhere new is a distraction in itself. Thankfully, the guys at Gro passed on their Gro Anywhere Blind to assist with this problem. The Gro Anywhere Blind is simply a sheet of thick fabric that can stick to any window using the suckers attached, blocking out any light. Before going on holiday we decided to give it a test run in our bedroom to see how easy it was to install and to see how dark it would actually make our room. The blind comes with a generous amount of suckers and pieces of Velcro to make sure the blind fits accordingly to the window. This also means you can have the blind installed vertically or horizontally. At home we installed in horizontally, on holiday; vertically. At home it just about fit our bay window which is really impressive as we have quite a large bay-like window. After installing it at home we immediately saw how it earnt it’s name as a blackout blind. Notice our cream curtains? They’re the culprits of many early mornings. Notice how dark it is in the middle? That’ll be the Gro Anywhere Blind. As soon as it was installed it was an instant transformation. Our room was completely dark and remained that way until little bits of light peeked through the edges of the bay window where the blind couldn’t reach. The installation was really easy and despite having rather *coughs* dirty windows, the suckers on the blind managed to stay on the window and without falling off. Using it on holiday was an absolute breeze as well. 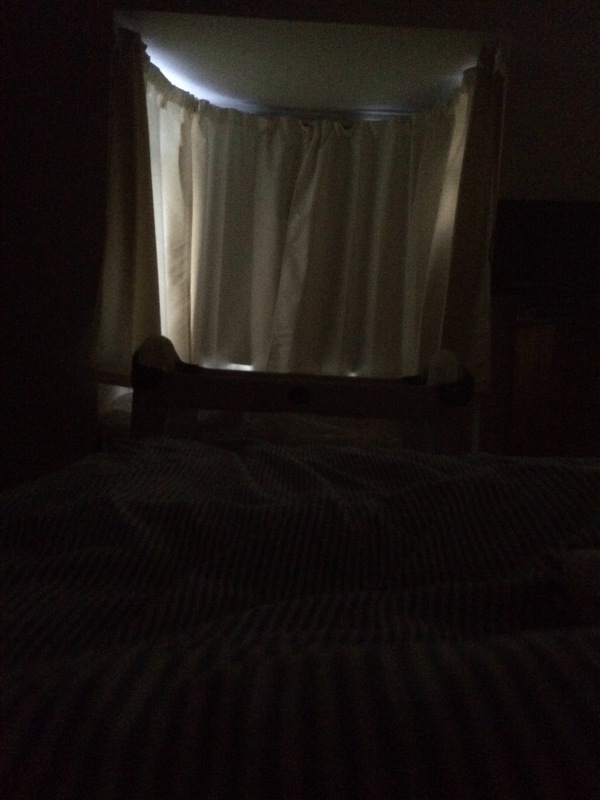 It really made a massive difference not only to the light entering our bedroom but it also created a nice layer between the window and the curtains; meaning our room was extra warm. We even noticed that when the light hit the blind it actually warmed it up to a degree where you think it’s actually a radiator! Very impressive! When we finally had to take it down it was simply a case of pulling at the suckers and folding it away. The bag the blind comes with is a generous size and there’s no struggling to get the blind into the exact shape it was in the shop to fit the bag. 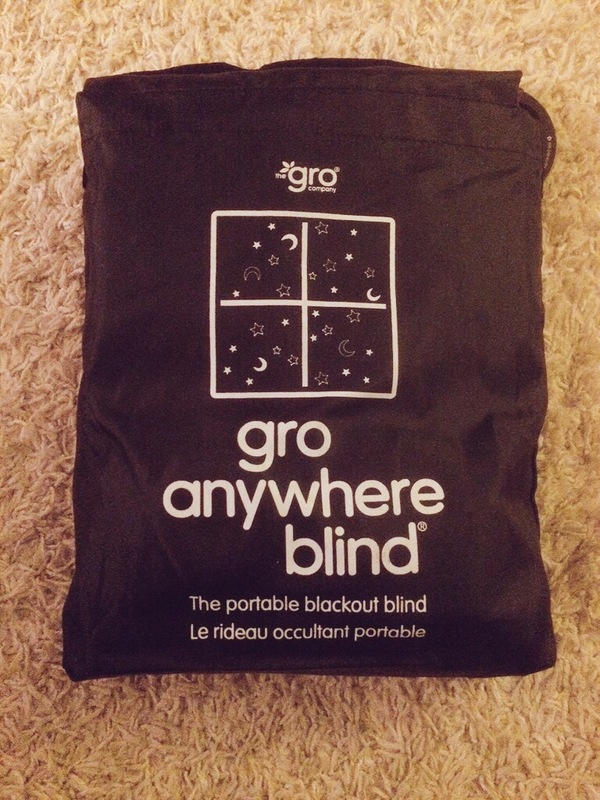 We really like the Gro Anywhere Blind. It’s light, easy to travel with, and does what it says. We’d highly recommend it if your little one needs darkness to sleep. We were given the Gro Anywhere Blind for the purpose of this review. All opinions, however, are our own. How do you get these companies to give you things to review? Sometimes companies approach us, other times they ask for bloggers on Twitter to review things and we apply.